The First and Second Amendments of the United States Constitution, along with their current legal interpretations and applications as they relate to our public schools and universities, weigh heavily on my mind—especially this week in the wake of the latest in the string of school mass murder shootings and in the wake of the latest in the string of “public square” free speech debates at the University of Washington where I teach. The Second Amendment right of citizens to bear arms should not include the right of angry, violence-loving individuals to own and use assault weapons on our school children as has happened in rapid-fire, soul-numbing fashion in our country. It should not include the right to bring—and use—firearms to the public squares of our universities (as happened at my own university last January during a “free-hate speech” protest/counter-protest on Red Square, pictured above with our grand Suzzallo Library in the background. See the Seattle Times article “Couple charged with assault in shooting, melee during UW speech by Milo Yiannopulos” by Mike Carter and Steve Miletich, April 24, 2017) Of course, we need better mental health services throughout our country, but this is not about mental health, it is about saner gun safety regulations. Gun-related violence in our country is a major public health issue. Although hampered by the successful lobbying efforts of the National Rifle Association to curtail public health research since 1996 (see: The Atlantic article “Why Can’t the U.S. Treat Guns as a Public-Health Problem? by Sarah Zhang, April 15, 2018), we do have sufficient evidence to start making positive changes. Nicholas Kristof’s NYT article with amazing graphics, “How to Reduce Shootings” (February 15, 2018) illustrates some of these options. I do take issue though with his point that gun-violence deaths at our schools pale represent just a small fraction of the total number of gun-related fatalities (including suicides) in our country. That does not take into account the detrimental health effects of the daily very real threat of school shootings on the millions of students, teachers, coaches, and administrative staff members at all of our schools, colleges, and universities. And as to the First Amendment right to free speech that includes hate speech—because one person’s hate is another person’s love or something along those lines? Having grown up during the Civil Rights era and personally benefiting from the rights to both free speech and academic freedom, I do understand (even if I don’t like) the fact that a known White Nationalist group (sponsored by the UW student club College Republicans) was allowed to speak at the University of Washington campus last Saturday. What I do not understand and do not agree with was the fact that other legitimate UW scheduled events that day—as well as the two UW libraries on Red Square—were forced to close/be cancelled because of the credible threat of violence incited by this event. A white nationalist hate group, in effect, closed the major libraries of our public university for an entire day, and in the name of free speech? Our library’s mission statement includes: “advances intellectual discovery and enriches the quality of life by connecting people with knowledge.” Our libraries are core elements of the teaching, research, and service mission of our public university. Their work cannot be allowed to be curtailed by hate and violence. #enough of all of that. Dream big. Take calculated risks. Be innovative and creative. Work collaboratively. Be open to learn from other countries and other communities and support the global to local connections. Dare to be labeled woo-woo. Remember nurse power! Those are the lessons I have been learning—or relearning lately as I help launch the Doorway Project, a campus-community interprofessional innovative collaborative project aimed at reducing if not ending youth homelessness in the University District of Seattle. It is a form of public scholarship and includes creative data-gathering and design modalities including participatory community mapping, photo voice, and participatory digital storytelling videos. It’s final product will be a youth-centric human/community designed community cafe modeled after the amazing Merge Cafe in Auckland, New Zealand. It is ambitious and audacious and it just might work. We have our kick-off and first pop-up community cafe and community participatory design activities this Sunday, December 3rd, noon-4pm at the lovely community center University Heights in the U District of Seattle. Here is an edited down 4-minute version of a longer interview I did today with our local U District public radio station KUOW 94.9 FM. Many thanks to them and especially to Producer Andy Hurst whose mother happens to be a nurse. In order to muck through the swampy wicked problem areas, we need–more than ever–the humanities. Before we continue down the path of denigrating the humanities (Rubio wanting more welders/less philosophers) and decimating university programs in the humanities, we need to ask ourselves if this is who we want to be–both individually and collectively. Where would we be without grounding in history, language, literature, comparative religion, philosophy, ethics, archeology, the theory/philosophy of law, and the criticism/theory of art? The excellent short (7 minute/ June 2013) video “The Heart of the Matter” by the American Academy of Arts and Sciences explores this question. “No humanities? No Soul,” George Lucas states. William ‘Bro’ Adams, Chairman of the National Endowment for the Humanities (NEH), gave a speech this past week at the University of Washington’s newly opened (and gorgeous) Native American center, called the Intellectual House. Adams reminded us that both the NEH and its sister organization, the National Endowment for the Arts, are 50 years old this year. In 1965, President Johnson signed the act designating both the NEH and the NEA, and he made them a central part of the Great Society. Adams was, of course, ‘preaching to the choir’ in that most of the audience consisted of academic-types from the different disciplines traditionally considered the humanities. I didn’t recognize anyone else from the health sciences, and none of the audience members asking questions identified themselves as being from science or technology fields. This was disappointing, although not surprising. After all, even physically the UW’s Intellectual House is surrounded by buildings that house the humanities and is a far trek from health sciences or any of the science and technology buildings. But as Adams emphasized towards the end of his talk, there’s a great need to increase the intersection of the humanities with science/technology/medicine (health sciences more broadly). The humanities bring the important tools of reflection. Reflection on what it means to be human. Reflection of what it means to be a citizen. Within a community health and health professions context, service-learning focuses on student engagement in non-clinically focused service work. Thus, our typical community health nursing clinical rotations are not technically considered service-learning, although the lines can get blurred at times. In a health systems course I teach for senior nursing students, I have included a service-learning option. Students in my course have concurrently volunteered as emergency youth shelter overnight workers, assisted in food banks, and served as buddies for hospice patients. Through this work they can step out of their ‘learning technical skills’ nursing student roles and begin to make systems-level connections and practice critical thinking skills. It has worked well because I’ve partnered with our wonderful University of Washington Carlson Leadership and Public Service Center. They do all the legwork in establishing and nurturing community partnerships, defining student service-learning placements, and monitoring student progress. Including service-learning in study abroad university-level programs can make for high impact educational experiences. Studies indicate that inclusion of service-learning in study abroad programs significantly increases students’ sense of connectedness with a wider world community. It also helps students confront their own biases and prejudices, and increases their comfort in working within diverse communities. But those benefits come from well-designed study abroad programs that include pre-departure workshops/readings, embedded critical reflective writing by students with faculty feedback, and debriefing sessions after service-learning activities. New Zealand is not a poor country and it continues to rank much higher than the U.S. on many health and wellbeing scales. Yet it suffers from rising socio-economic and health inequities. During our study abroad program we have visited a variety of communities–some have been in higher socio-economic brackets, but most have been within impoverished, multi-ethnic and Maori communities. Before doing any community-based service-learning projects, we’ve first learned about the local and national context, including cultural, political, and socio-economic factors impacting the community. Students learn this through carefully chosen readings, and from talks by community leaders. My co-leader for this program, Jim Diers, is a social worker and an international consultant on community-led, asset-based development. He has a decade or so experience working with various communities throughout New Zealand. So between his contacts and those of the New Zealand based community-development group, Inspiring Communities, we developed this study abroad program. Jim believes in more upstream thinking, policy-changing work versus direct service. It’s an important point, but I think there is room for both in life and in educating university students for their role as civically-engaged change agents. 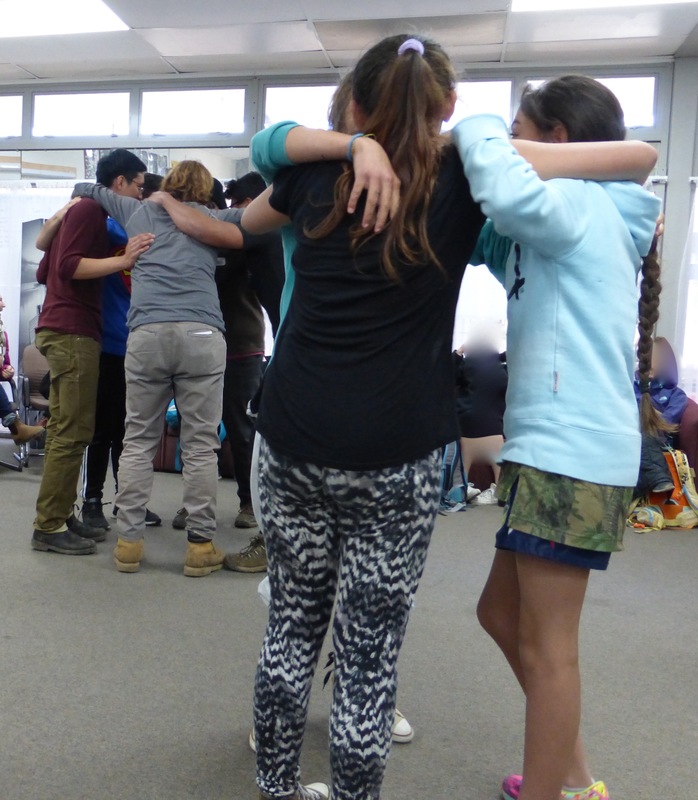 Students have stated that they are now more interested in knowing about and getting involved with their own ‘home’ communities, and of doing service-learning in the Seattle area. 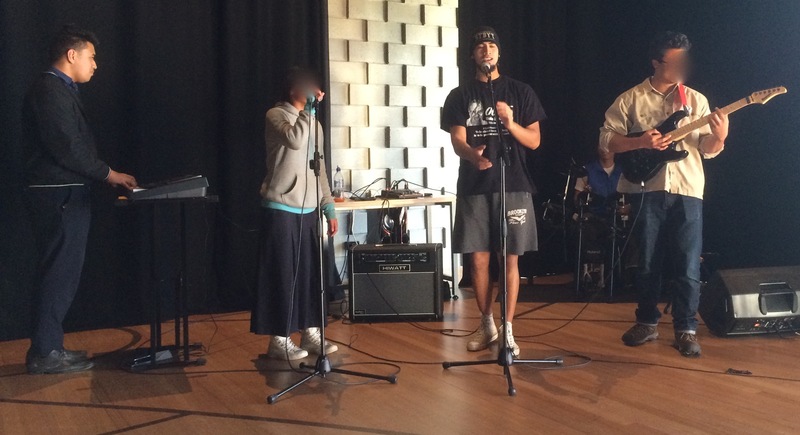 Spontaneous musical jam session with young people at the Te Oro music, dance, and art center in Glen Innes in East Auckland. We had spent the day on the Ruapotaka marae (Maori land and meeting house) and were planning to help with stream restoration but it rained too hard–stream flooded, so we did this instead. Girls from the Baking Club at the Waitangirua Community Services center challenged our male students to a fitness test. This is their pre-contest strategy huddle. Our guys lost and so they had to do a line dance/song. Everyone was laughing so much our faces hurt afterwards. But this was all initiated by the girls of the community. This is part of the Wesley Community Action program in the greater Wellington area. This photo is of a very spontaneous and unexpected service-learning project our students engaged in. We visited a community-primary school center in Epuni, north of Wellington. They have a huge school garden and this arts and crafts center where they bring together community elders with the children to share stories and teach craft skills. Our students were asked to help knit squares for blankets for the children. 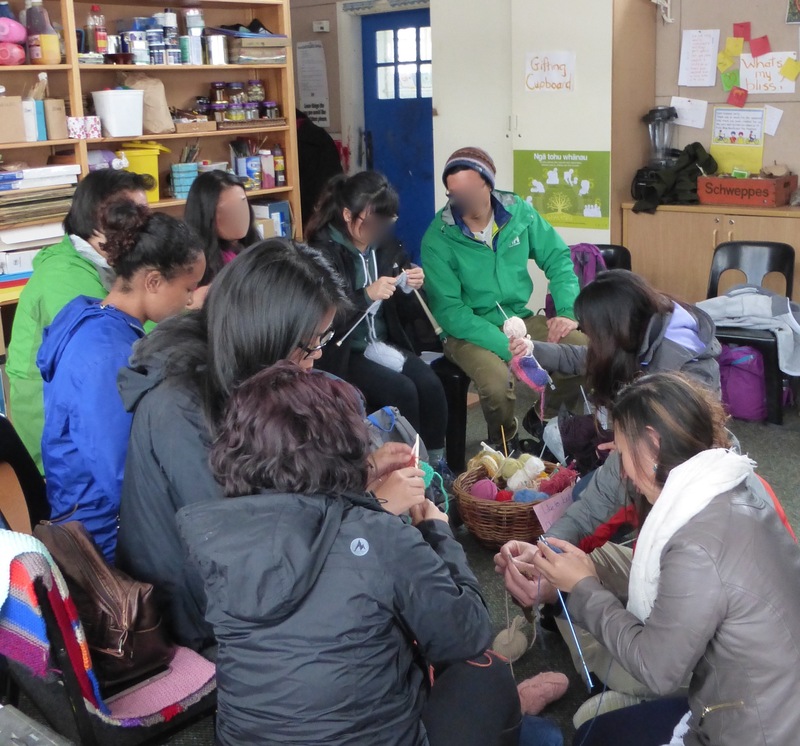 The students who knew how to knit taught our non-knitter students, who in turn taught other students. Amazing. 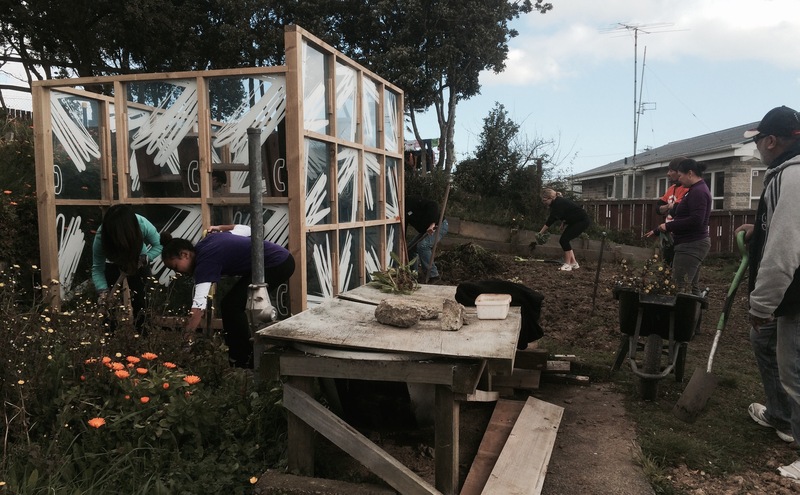 Donning our borrowed gum boots and getting down and dirty weeding, turning compost, and double-digging vegetable beds at the community Fruit and Vegetable Co-op headquarters in the heart of Cannons Creek, Porirua, Note the recycled glass paneled greenhouse (minus the roof)–they are from cast off phone booths. Here are photographs and brief descriptions of various service-learning activities the students have been involved with during the program. Some of the activities were planned ahead of time and others ‘just happened’ spontaneously. All of them were driven by the community members. They have expanded my notion of what ‘counts’ as international service-learning. 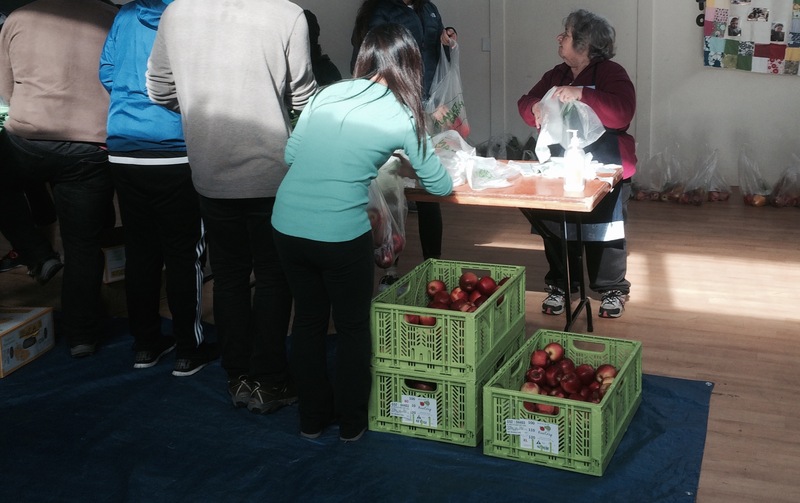 Helping bag fruit and vegetables at the Salvation Army in Cannons Creek, Porrirua, north of Wellington. This is part of a fruit and vegetable co-op in one of the more impoverished areas of New Zealand. But as the residents told us that day–the government calls them impoverished… The New Zealand public health unit helps fund this innovative ‘non-charity’ project. Apolitical Intellectuals Teaching Health Policy? Collection of health politics and policy teaching materials on my desk at work. Is it desirable, indeed, is it even possible to teach health policy without also teaching politics? What would it mean to be an apolitical intellectual teaching health policy to future health care professional students? As a lyrical definition of ‘apolitical intellectual,’ here are the first stanzas of a poem by the Guatemalan poet and revolutionary Otto Renee Castillo, translated by Francisco X Alarcón. 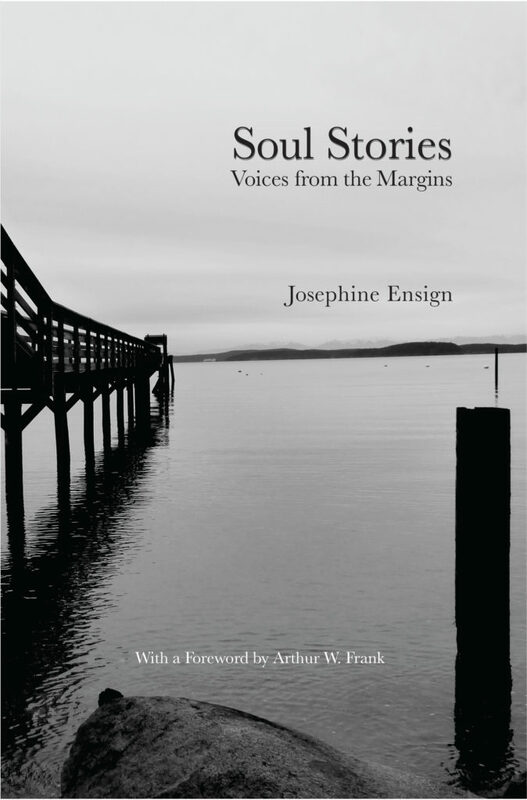 The full text of poem is available here and a powerful ‘spoken word’ version using a slightly different translation is available here . Basically, as I would interpret it, apolitical intellectuals have a lot of book knowledge and an escapist ‘life of the mind’ sort of attitude, but no practical, down-to-earth working knowledge of power and privilege. I do not aspire to be an apolitical intellectual teaching health policy to future health care professionals. But I do aspire to be balanced and fair in my approach to teaching health policy. That is one of my prime duties as a teacher. Since I lean towards the Progressive side of politics, especially as politics relates to health and social justice issues, I bring that lens to the teaching of health policy. Many of my health policy current events articles come from the NYT or the (non-partisan but still left-leaning) Kaiser Family Foundation, and many of my videos (as in the photo above) are produced by PBS. I have tried, with limited success, to bring in more Conservative-leaning course readings, videos, and guest speakers. I find that it is difficult to find credible, intelligent, research/data-backed Conservative sources. 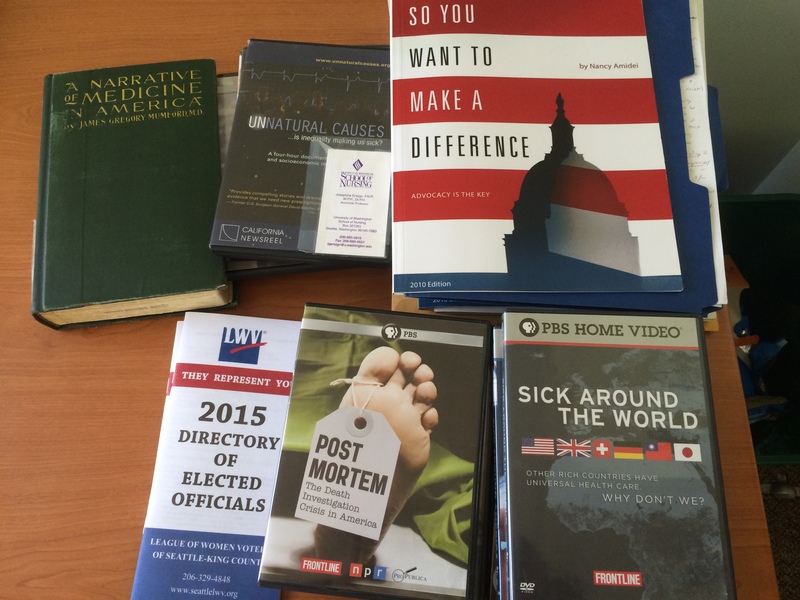 Since I am about to go on a year-long sabbatical in order to focus on my Skid Road and Soul Stories research and writing projects, I get to put away my health policy teaching materials. Both projects are public scholarship focusing on health policy for homeless and marginalized populations. As such, they are taking me even further away from being an apolitical intellectual. I consider that a good thing, but I do wonder how it will affect my teaching of health policy once I return to the university.